The world-renowned rock climber and East Bay resident who survived a terrible fall last week on Yosemite’s El Capitan said he was briefly in "agony" as he coped with a painful, hourslong predicament thousands of feet above ground. 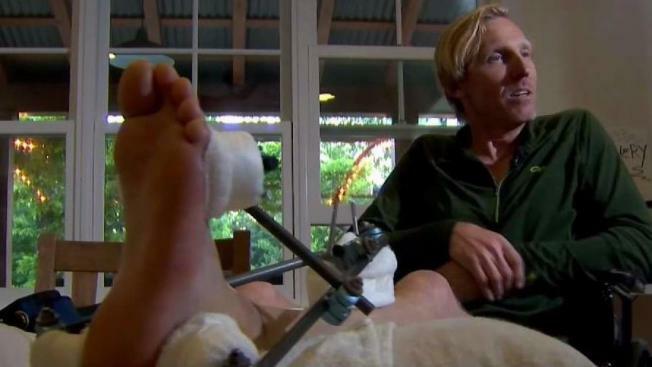 Hans Florine, 53, told NBC Bay Area he was 2,300 feet up the popular peak when he suddenly found himself upside down, hanging by a rope, with a broken ankle and heel. Florine said he somehow stayed calm, as did his climbing partner. He overcame the pain by becoming a spectator in his own life, looking at his situation as if someone else was undergoing the ordeal, he said. He then shot a video and posted it to Instagram. The video shows Florine moments after he plunged 20 feet while climbing the nose of El Capitan, which rises over 3,000 feet above the floor of Yosemite Valley. "I’ve done it a hundred times," Florine recalled of the favorite spot for rock climbers. "Now I’ve done it 110 times." Florine suffered a shattered right heel and a badly broken left ankle and has surgery scheduled on both next week. This week he was able to recount the accident in detail. "You are placing gear into a small crack all the way along for 3,000 feet. You place in gear every 3 to 6 feet," he said. "I set it in the crack, I tested it and then when I stood up on it, it popped out. The piece that was only 4 feet below me caught me but the rope didn’t come tight until I had already banged my heels, landed on a ledge and then fell another four or five feet over the ledge," he said. What happened next: "I flipped upside down, actually had my back against the wall, head down. I was in agony for a millisecond, and my body pumped me full of endorphins and locked this all up." Florine has literally written the book on climbing El Capitan. The 2016 tome, called "On the Nose: A Lifelong Obsession with Yosemite's Most Iconic Climb," details his most dangerous and death-defying climbs. During his latest scare he stayed calm, as did his partner. They fell to a certain point then lowered down 200 feet to a ledge that was a little more comfortable for them to rest, Florine said. It was 2 p.m.
A rescue team got Florine back to the top about eight hours later. Florine said someday he’ll climb back up. "I know stuff is possible still," he said.